Over 82% of our registered vehicles are Nissans, so we wanted you to know that we have two great guides to help you find the data we ask for: Click Here to find out how to find data on your dash, and Click Here to find out how to scan your battery with Leaf Spy. We ask you on sign up “How techy are you?”. If you selected “as few questions as possible”, you may now wish to try and obtain data from your dash, using the guide above. It’s really easy! If you already jot down the dash data, great – and you may wish to start using LeafSpy to get even more data directly from your battery. If you’re ready to make the jump, just email us on wecan@flipthefleet.org and we can quickly change your setting so you can add more data. We have also built some new functionality to save you time at each log in – you can now set a 4-digit PIN, and use that to sign in instead. To do so, please sign into the Flip The Fleet dashboard, go to Settings, choose Personal Settings, and then enable your PIN. We have also reshuffled our input fields and grouped them into logical sections, making it much faster for you to add your data. And lastly, we’ve now implemented some data validation rules, meaning we’ll be able to catch obvious bloopers before you add your data each month. Why did you switch? April’s 1-click survey: Your responses to April’s 1-click survey about why you bought your EV was the usual mix of passion, global and local vision and perceptive comments on how we get more people to join the EVolution (http://flipthefleet.org/2018/1-click-survey-18/). Green credentials topped as the main reason for switching (49%), and then can low running costs (33%). It will be important to target our messages in different ways as we move from “early adopters” (that’s you folks!) and get more into motivating the “early majority” (the next wave following you). We have now built 10 automated systems for uploading data from Leafs and eNV200s. They will be fitted to fleets as part of a trial we are doing for the New Zealand Government’s LEV Fund grant administered by EECA. We found that many commercial fleets wanted to contribute to Flip the Fleet but getting the data off lots of cars at the beginning of each month was a real hassle – this should make it a whole lot easier. Efficiency gains from the Eco setting in Leafs? Around 30 members of Flip the Fleet from Otago did an experiment last November and December. Half selected ‘Eco’ in November while the others used ‘Drive’; and then they swapped over in December. The results were posted at http://flipthefleet.org/2018/a-community-experiment-to-measure-the-effects-of-eco-and-drive-settings-in-nissan-leafs/ last week. Eco lifted efficiency by around 2.9% and will save the drivers around a $1 per month in summer. Let us know by emailing wecan@flipthefleet.org if you want to join a similar experiment to measure the efficiency gains from Eco mode in winter – we expect an added lift because the Eco setting reduces the power drain from cabin heating, and because stop/start conditions and wet roads will recapture more energy from regenerative braking. If there is enough interest we might also test the value of a mixed strategy in which Eco is selected for downhill and stop-start conditions, but Drive is selected for flat and uphill travel and when steady momentum is expected. 30 kWh Nissan Leaf battery health: Nothing has been heard from Nissan in response to our report on rapid decline in 30 kWh reported battery capacity – see http://flipthefleet.org/2018/30-kwh-leafs-soh-loss/ for the summary. We are grateful for several new sign-ups to Flip the Fleet in response to the scare. Many are scanning their batteries so we can track what unfolds from now on. Don’t be too alarmed if your battery “State of Health” dips down a bit faster than usual in the coming months as winter sets in – there is a seasonal pattern underlying the trajectory which relates to measurement rather than real decline in battery health. Teaching resources: We have not yet had enough time to enrich our EV teaching resources register at http://flipthefleet.org/resources/teacher-resources/. Are there any teachers out there in our midst that might take our data and run with it to create some innovative lessons for maths, physics, chemistry, society and economic curricula? If so, give Henrik a ring on 027 2268688 or email a request to wecan@flipthefleet.org. EV Black Box. What does it do, and what does it cost?. is it part of automatically up loading data from Nissan Leaf, and will there be one for MiEV? Hey Axel! 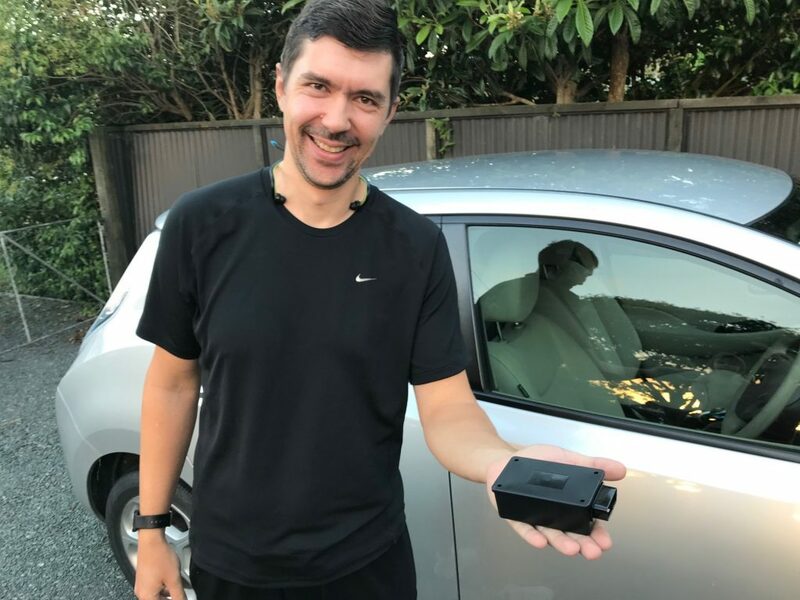 The EV Black Box is a dongle that our developer Vasily has built that collects data autonomously from Nissans (Leafs and e-NV200s). We have not yet tested it on the i-Miev. The cost isn’t set yet as we’re still trialling them “out in the field”. Correct me if I am wrong but there is no mention of other positive consequences the ECO setting has. Driving with the ECO off will cause higher torque with less throttle input and thus more wear and tear on the drive train, in particular the tires. As some other article explains, the present tires appear to be poorly designed for the high instant torque from stand-still and special better wearing EV tires are being designed. While it is fun to beat the boy-racers, it has its consequences.